Veesible at latitudes atween +40° an −90°. Best veesible at 21:00 (9 p.m.) durin the month o Julie. 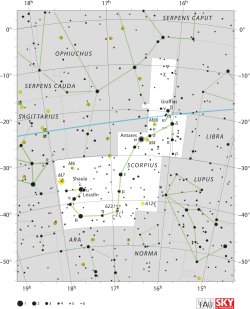 Scorpius, whiles kent as Scorpio, is ane o the constellations o the zodiac. Its name is Laitin for scorpion, an its seembol is (Unicode ♏). It lies atween Libra tae the wast an Sagittarius tae the east. It is a lairge constellation locatit in the soothren hemisphere near the centre o the Milky Way.